Hands off: the AirPiano relies on infrared sensors. 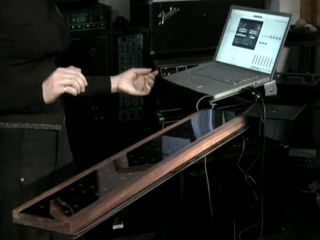 Back in 1998, MusicRadar reported on the AirPiano, a new concept controller that could be played without being touched. Having heard nothing about it since, we foolishly assumed that the idea had been kicked into the long grass, but far from it. The first AirPiano prototype was given to UK artist Jo Hamilton late last year, and she's been getting to know the instrument and making music with it. You can see what she's been up to in the video above. A longer clip, which features more performance footage, is below. The AirPiano was originally developed by interface design student Omer Yosha in Berlin and uses an invisible matrix of controls. He says that we can expect "a brand new design with new features in a product that will soon be available," so it seems that the current prototype may be just a starting point.